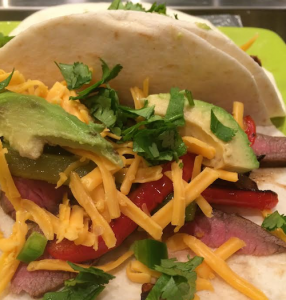 Steak Fajitas – Damn Life is Good! This is our go-to recipe for a simple but delicious (and quick) Mexican meal. We often use what is on hand and omit whatever isn’t so we don’t have to make a store run! The recipe is very flexible and we let everyone make their own. Marinate steak for at least 1 hour (or up to 8 hours). Leave whole for grilling. Heat oil in a large pan over medium-high heat. Add onions, peppers and Worcestershire sauce and stir until softened. Sprinkle on garlic salt when they get soft. Grill meat on high heat for a few minutes on each side… you are shooting for medium rare (we lean even more rare). When done, set on cutting board to rest for 5-10 minutes, then slice along the grain. Pro tip: make a little 50-50 mixture of sugar and kosher salt (maybe a tablespoon) and sprinkle on meat before grilling to get awesome caramelization and grill marks. Assemble all the goodies together on warm tortillas and enjoy with a nice Spanish or South American red.